Good morning on New Year’s Eve 2009 as we here at LDV Towers celebrate the passing of the year and indeed the decade. There’ll be fizz spilled on the Night Desk for sure, and I’m cooking beef wellington canapés and a chocolate/chestnut torte. But what, I hear you ask over the hubub, happened on this day in history? Well, did you know that until the 1750s, the new year actually began on Lady Day (no, not her) in March? And in fact that’s why the tax year is still based around that time of year? 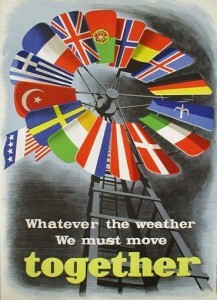 New Year’s Eve is the day on which, in 1951, the Marshall Plan ended (did you know the UK got more money out of it than any other nation? It didn’t help we still had the vestiges of empire to spend it in). In 1960, the farthing ceased to be legal tender; and in 1998, the value of the Euro was first establised. Birthdays include Ben Kinglsey, Donna Summer, Val Kilmer and Alex Salmond – together at last! Don’t forget Lib Dem Voice is still seeking your nominations for Liberal Voice 2009. David Cameron opened the batting on Monday with his New Year message, at a time when most of us simply wished to get on with Boxing Day in peace. It was a ludicrous document – ludicrous in its content and the pomposity of its self-regard – which you will forgive my not repeating here. Masochists will find it on the Conservatives’ website, complete with video. Two features of it stood out. The first was a lecture detailing some (but not all) of the attributes of contemporary politics and politicians that we find so distasteful. These included the adversarial nature of our democracy and the inability of those who participate in it to admit error. Since it already defied credibility that Mr Cameron was going to reject such behaviour for his own part and on behalf of his colleagues, I was not sure whether I was relieved or disappointed when he not only said he was guilty of such things, but would no doubt do them again. As messages of hope go, it was not of the first rank. In news bound to please Lembit, the Russians are looking into plans to save humanity from the rapacious asteroid with a 1 in 125,000 chance of hitting the planet. Anatoly Perminov, the head of Russia’s space agency, said it would assess the difficulties of knocking the asteroid Apophis out of harm’s way. The 885-foot-wide asteroid was first discovered in 2004. Astronomers estimated the chances of it smashing into Earth in its first flyby in 2029 were as high as 1-in-37, but have since lowered their estimate. Police chiefs, who will be trying to ensure the safety of huge crowds seeing in the new year in town and city centres, urged revellers to wrap up warm, but to keep a cool head. People should plan their route home before they start drinking, and be prepared for sleet and snow, they said. A comfortable place: what a waste! In this part of Sussex we face a waste crisis. LibDem controlled Lewes District Council would like to recycle more of its waste than it does. But it’s not allowed to. The Government claims to care about Royal Mail’s future, yet Liberal Democrats have learned, through answers to Parliamentary Questions, that no fewer than eight Government Departments use its competitors. Three of these departments, Culture, Media and Sport, Communities and the Foreign Office don’t use Royal Mail at all, while the other five, Children, Schools and Families; Health; Justice; Transport; and Work and Pensions use other services for part of its mail. And if you’ll excuse me, these mushroom duxelles won’t make themselves. Back to our friends for a New Year’s extravaganza lasting all afternoon and into the night, and up until the change of decade if we’re not flagging by then. 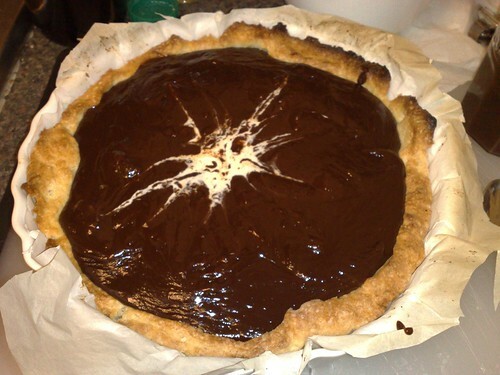 Today’s pudding will be a chocolate/chestnut torte, made like this: blind bake a pastry case made from 8oz flour, 4oz butter, 1oz sugar, 1 egg and enough water to bring the breadcrumbs into the necessary paste. Chill the dough for an hour then press into a greased or lined tin, and blind bake at 180 deg C until golden brown. For the filling, heat 200 grams of dark belgian chocolate with half a tin of chestnut purée, 125 grams of sugar and 100mls of double cream. Heat in a glass bowl over a pan of boiling water or in a double boiler, so as not to burn the chocolate. Do the best you can to desolidify the block of chestnut, since it comes out of the tin looking worryingly like cat food and is pretty tricky to get to break up. 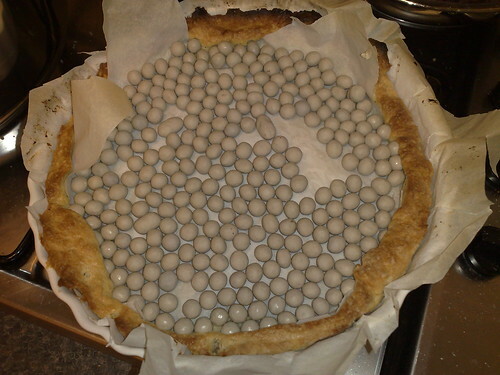 Once the mix is smooth and lovely, pour it into the pastry case and allow to cool. If there is spare chocolate sauce, pour it into a jam jar – it will work as a toast spread for a few days, or can be reheated as chocolate fondue. Although this is a pudding club post, there will be savouries as well. There will be a raclette! And I am contributing another recipe I just made up: beef wellington canapés. Beef Wellington is something I’ve had at posh functions, but never actually cooked myself. It tends to be a little disappointing when it’s being cranked out by the hundred by the rubber chickeners, so one day I must try and make it myself. As far as I understand it, it’s a slice of beef steak, with either pâté or mushrooms duxelles, wrapped in pastry and baked. One day, I shall have to have a go. So to make canapés, after reading around a bit, I settled on thin slices of beef intended for sandwiches, a pot of Co-op Ardennes pâté, and homemade mushrooms duxelles all neatly (!) wrapped in filo. For the mushrooms duxelles: first prepare about 200grams of mushrooms by chopping off the hard stalk bottoms and slooshing under the tap. Melt a big knob of butter in a frying pan and grate in some nutmeg. Add a little olive oil to stop it burning. Finely chop 50grams of streaky bacon into the pan with scissors and stir until cooked. Using the “slice” side of a box grater, finely slice the mushrooms into the butter / bacon mix. Stir occasionally to stop it from sticking. When all the mushrooms are in, keep stirring until they are cooked and given up their juices. Add a generous teaspoon of Bisto gravy granules (what? what made you think this was posh?!) and stir until dissolved. Add a good measure of sherry or port, and keep on a medium heat until almost all the liquid has boiled away. Don’t burn them, but don’t leave them too moist, or they will soak through the pastry. To make the canapés, unfurl the filo pastry. 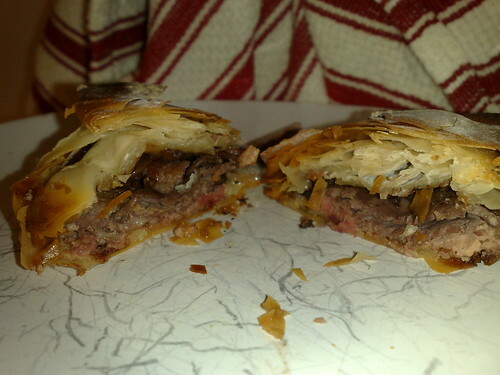 Chop up the sandwich beef slices so that there is a portion of beef for each filo sheet. This meant quartering three slices to make 12 pieces, in my case. Fold two opposite corners of the sheet into the middle so they overlap to make 3 layers of pastry underneath the filling. 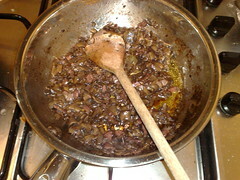 Smear with pâté, add the slice of beef, and spoon a teaspoon of mushrooms on top. Close up the filo sheet so it is reasonably waterproof. Continue until the ingredients run out. At this point they can be stored in the fridge for a day until they are needed. When they are, cook for 8-12 minutes on greaseproof paper. Try not to get the greaseproof and the filo mixed up when they come out of the oven. Today there will be a blue moon – the second full moon within one calendar month. This doesn’t happen very often – once every few years. The next one will be August 2012, with the full moons falling either side of the London Olympics. This time, there will also be a partial lunar eclipse. Those reading from Australia don’t get their full moon until January 1st, which makes January the blue moon month for them. I read about this first on Wikipedia by accident quite some time ago, and put it in my diary to look out for when it happens next. A full moon occurs every 29.5 days, and most years have 12. On average, an extra full moon in a month — a blue moon — occurs every 2.5 years. The last time there was a lunar double take was in May 2007. New Year’s Eve blue moons are rarer, occurring every 19 years. The last time was in 1990; the next one won’t come again until 2028. Blue moons have no astronomical significance, said Greg Laughlin, an astronomer at the University of California, Santa Cruz. “`Blue moon’ is just a name in the same sense as a `hunter’s moon’ or a `harvest moon,'” Laughlin said in an e-mail. I’m reading a piece from tomorrow’s Times, thanks to the magic of the interweb, and this little possibility of sub-editing fair jumped out of the page at me. It makes it seem as if the Police don’t share Boris’s enthusiasm. A big crowd is expected for the fireworks display at the London Eye tonight and Boris Johnson, the Mayor, promised a spectacle that would show the world that “the most exciting city on Earth” was looking forward to the future with “optimism and energy”. […] The Metropolitan Police urged people to wear warm, waterproof clothing and be prepared for crowd congestion and long delays. Hmm, now I write it out, it seems less funny. Oh, well, I’ll hit publish anyway.